Slippery was the only way the track could be described during the first round of the 2011 UEM European Championship, held at the old Russian airfield base near Kunmadaras in Hungary. Difficult to tune against when you have 1000+ horses to play with, and with all changes Ton and Vincent Pels made over the winter, not the ideal situation to start with. But the Zodiac Racing team did more passes then ever before during a race meeting. And their supercharged Nitro Harley is for sure a force to be reckoned with for the 2011 season. This winter the team did a lot of work to try and get the bike more reliable. Last season the main problem was heat and how to get rid of it. Apart from bending valves and burning up guides, the heat problem was so bad that the exhaust port of the cylinder head was melting and therefore the valve seat lost all its support. Their partners were consulted for technical knowledge and along with Kibblewhite Precision Machining new exhaust valves and guides were developed from the most exotic materials available and Supertrapp was asked for advise for a new exhaust system design. But by far, most time was invested in “skulling” the cylinder heads. Complete copper alloy combustion chambers, so called skulls, inserted in the heads were developed and with all the extra parts that had to made “a little different”, along with the engine cases that had a connecting rod kicked out at the European Finals last year, the team was again very busy during the winter months. They would have liked some track time to dial everything in before the opening round of the European championship in Hungary, but with the Easter race at Santa Pod Raceway only one week before, it was decided to skip the testing and try to dial in the bike during qualifying. The first qualifying run was supposed to be a half pass, but only took about 0.2 seconds. Instead of going forward, the bike simply jumped up and smoked the tire at the hit of the throttle, so Roel Koedam quickly got off the throttle and idled to the finish line. For 2nd qualifier the bike was backed down and with the right lane being a fair bit better, the bike was able to find some traction and ran a reasonable 7.179, taking the provisional 2nd spot 0.01 seconds behind Hans Olav Olstad. Hoping the left lane would turn for the better, nothing was changed for the 3rd qualifying round Friday afternoon, but the result was identical to the 1st qualifier, the bike simply smoked the tire at the hit of the throttle. During the evening the heads and cylinders were taken off for inspection and everything came out brand new. It seemed that all the hard work Ton and Vincent did over the winter was worth it and everything was quickly assembled and the bike was ready for the next day. For the Saturday morning session the adjustment of the fuel system was changed a bit, as the engine did not ran clean all the way when it ran the 7.17, but the tune-up of the bike was still kept conservative in every sense. At the launch the bike hit a huge tire shake until the 60ft, but after the 2nd stage of the clutch came in, it picked up the front wheel and went like a rocket. Carrying the front wheel way past the 330ft marker the bike suddenly went rich and nosed over. Back in the pits Roel said that the bike did not changed gear, and a quick look at the data logger confirmed it. A petty, as the 4.464 1/8th mile time was the quickest first half in qualifying. The last session was rained off, so the team could not improve their E.T. of 7.17, which put them in 6th spot on an extremely close qualifying ladder. After qualifying was cancelled the bike was checked out and the connecting rod bearings were changed, a normal maintenance procedure on Nitro Harleys. Because they did not have lane choice, the team again de-tuned the bike and it was ready for the eliminations. The weather for Sunday was a lot cooler and humid then the previous two days, but with the eliminations put on a shorter schedule, all the finals could be run in between the light rain intervals. In the first round, team Zodiac matched up with Finnish Samu Kemppainen, who was qualified 3rd with a 7.120 second pass on his recently imported 60 degree V-Twin. Being 0.05 seconds quicker in qualifying, Samu obviously chose the right lane. At the green, both bike overpowered the track and it became a real pedal fest (well throttle fest in this case). Roel smoked the tire on the first and the second hit of the throttle, but after putting the bike in high gear and giving it a 3rd attempt, the bike finally hooked up and was able to pass Samu, who was also struggling to find traction, at the 1000 foot mark. You can’t always win them pretty, but it was one very exciting drag race. In the second round it was young Jan Sturla Hegre. Again the bike was de-tuned, as again the team had the inferior left lane, and they had not put a decent pass on it yet. Roel was quicker on the tree after a little stage battle, but Jan’s bike was the quicker one this race. With the soft set-up in the supercharged bike, it never really accelerated hard, slipping the clutch from start to finish, so Jan was able to drive around Roel’s 7.198 E.T. with a 7.067 and eventually took the event win. The Zodiac team was not disappointed though. They made more passes then ever during a race meeting. The engine was performing without a hitch and all the parts help up very well. Next race is The Main Event at Santa Pod and the team hopes the track will be up to it’s normal UEM standard. They will start with putting back in some power and are confident that the changes they made, will give them the competitive edge. 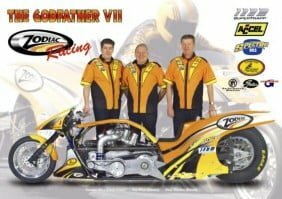 The Zodiac SuperTwin Top Fuel drag racing team is proudly sponsored by Zodiac International B.V., Supertrapp Exhaust Systems, ACCEL Motorcycle Products, Spectro Oils of America and Kibblewhite Precision Machining.